After knowledge of a topic has been developed, provide students with a written source addressing a key question relating to the topic, but with key details deleted. Students can then work alone or in pairs to anticipate how the source will look when complete. How will the author explain his points? What evidence will he use to substantiate them? Afterwards, students can compare their thoughts to the real source. What did they anticipate correctly? What evidence and arguments did they surprised them most? 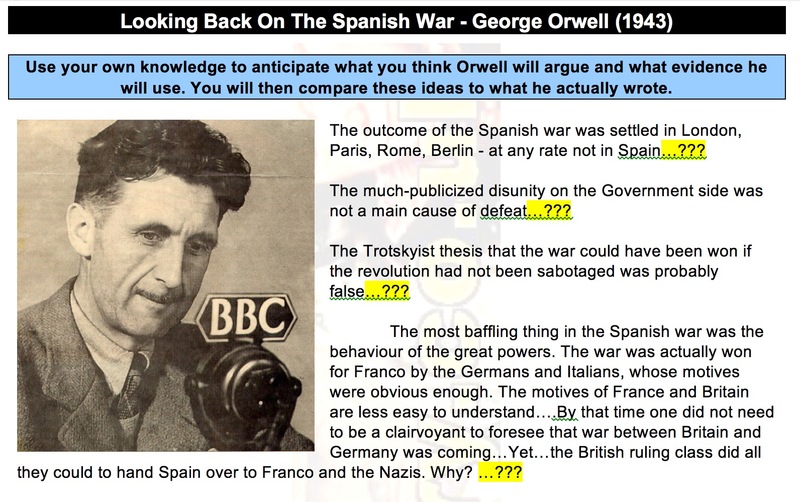 George Orwell explains why he thinks the Spanish Civil War ended with the defeat of the Republic. The example above comes from my study unit at www.activehistory.co.uk. For a similar exercise but focusing on statistics, check out this post.